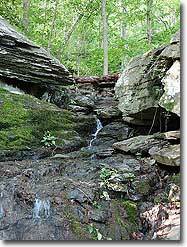 Great West Virginia Hiking Books! 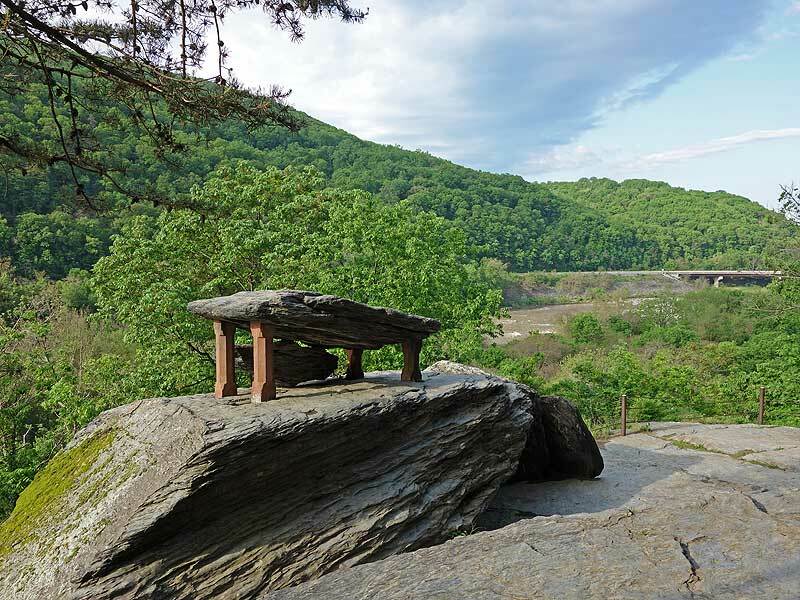 With Maryland Heights and C&O Canal/Weaverton Cliff, this is one of three beautiful vista hikes that start in the Harpers Ferry area. 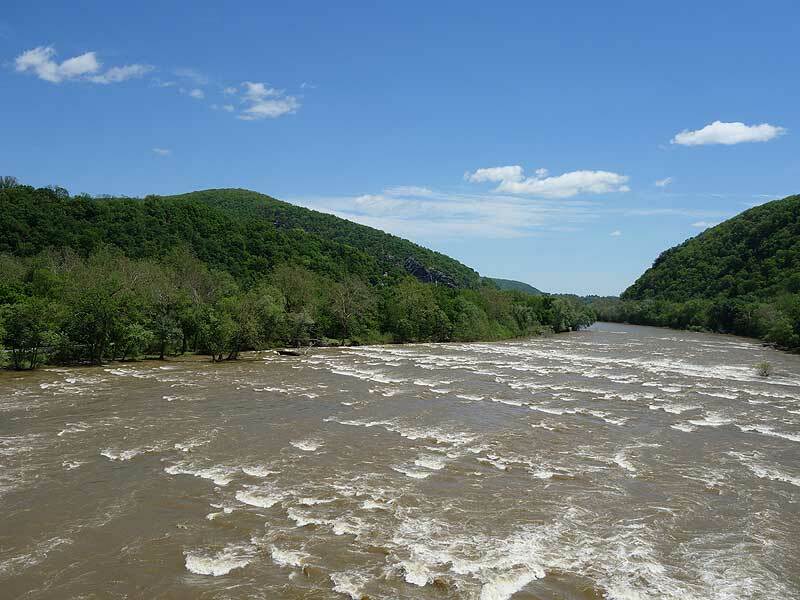 Significantly less crowded than the other two hikes, the Loudoun Heights hike also has several beautiful views of the Potomac River and Harpers Ferry. 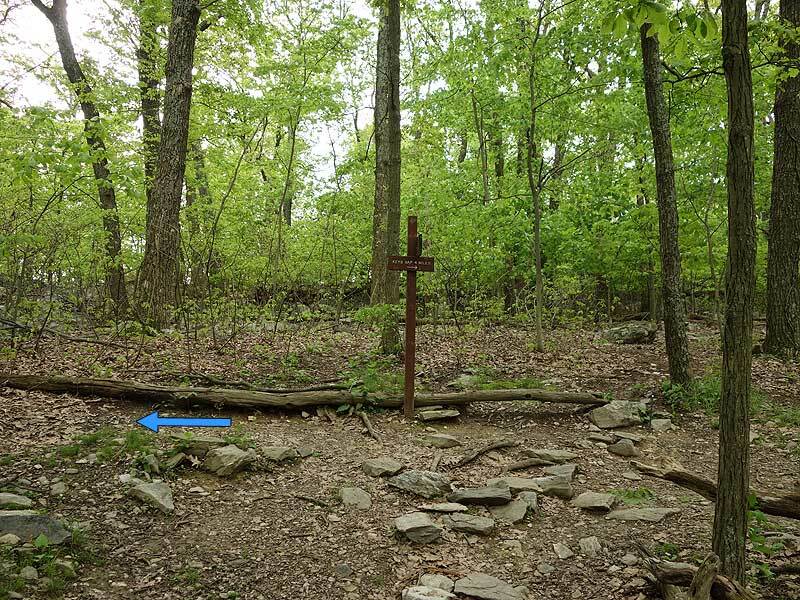 The first 1 mile is also steeped with history, climbing a flight of steps hand hewn in the 1800's, passing St. Peters Roman Catholic Church, the ruins of St John's Episcopal Church, Jefferson Rock, and Harper Cemetery. 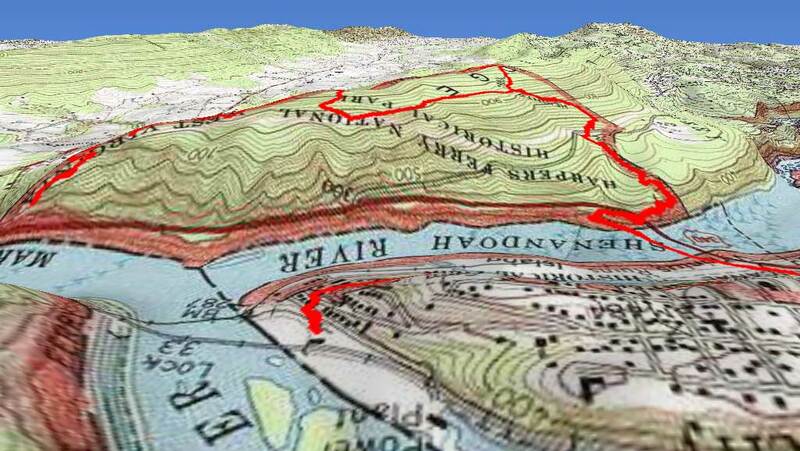 All before reaching the secondary parking area where the hike crosses the US340 bridge and Shenandoah River. 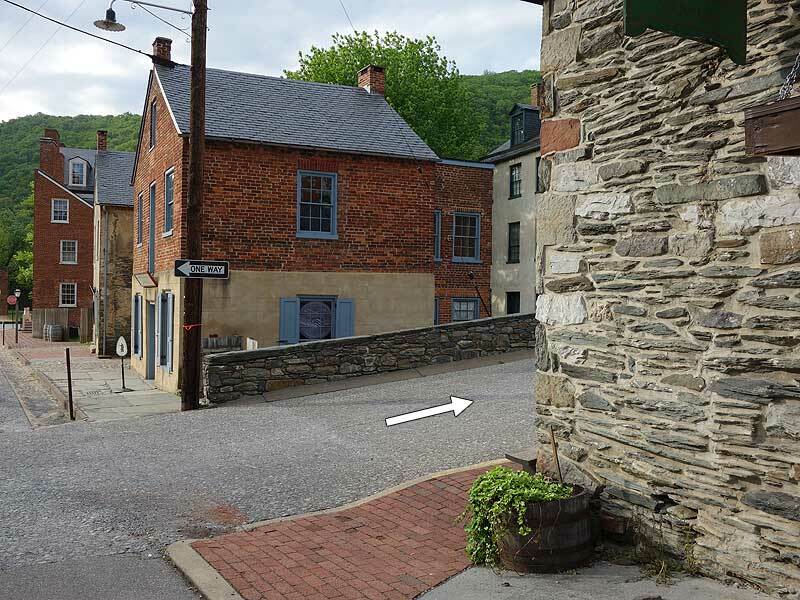 Mile 0.0 – From the parking area at the Harpers Ferry train station, walk a short distance down Potomac Street, then make the right up Hog Alley. 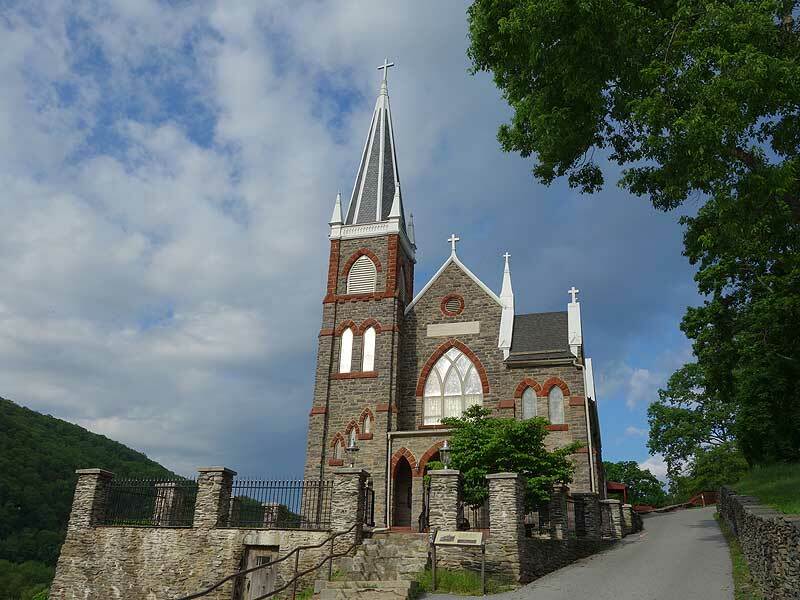 At the top of Hog Alley turn left, then in 50 yards turn right up the hand-hewn steps that lead to the most prominent landmark in Harpers Ferry, St. Peters Roman Catholic Church. 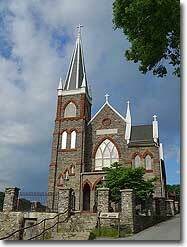 The church was completed in 1833 to accommodate the influx of Irish laborers that supported the construction of the C&O Canal. During the Civil War Father Costello flew the British Union Jack to symbolize the church's neutrality, which sustained minimal damage during the war. The church was remodeled in 1869 to today's appearance. 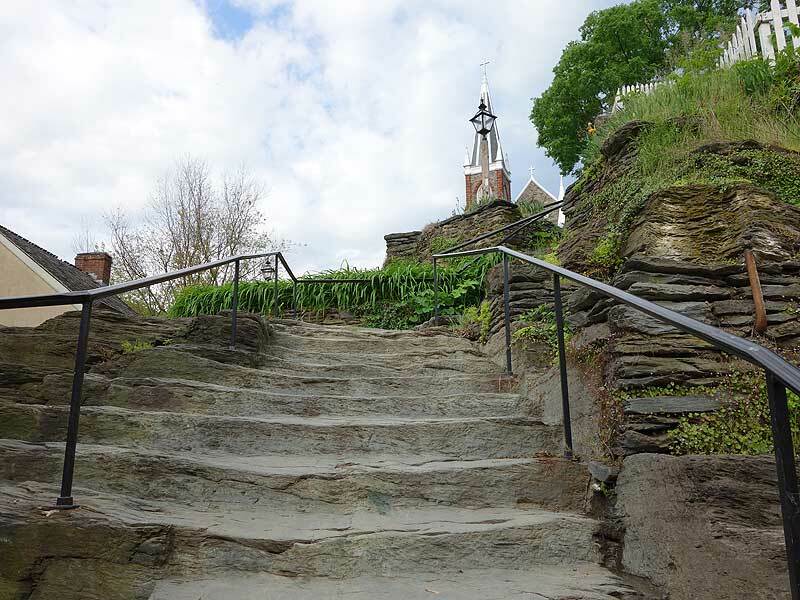 Mile 0.2 - Now follow the white blazes of the Appalachian Trail (A.T.) passing the ruins of St. Johns Episcopal Church on the right. 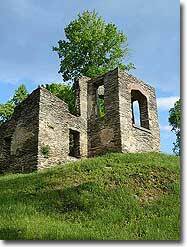 This church was used as a hospital and barracks during the Civil War, and sustained considerable damage. The church was abandoned in 1895 when a new church was built in the upper town. 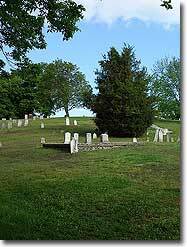 From St. John's continue a short distance to Jefferson Rock on the A.T.
Mile 0.3 - In 1733 Thomas Jefferson on visiting this spot proclaimed: "On your right comes up the Shenandoah, having ranged along the foot of the mountain a hundred miles to seek a vent. On your left approaches the Patowmac [Potomac], in quest of a passage also. In the moment of their junction they rush together against the mountain, rend it asunder, and pass off to the sea ... This scene is worth a voyage across the Atlantic." Around 1860, the US Armory Superintendant ordered red sandstone supports placed under Jefferson Rock because it was "endangering the lives and properties of the villagers below." 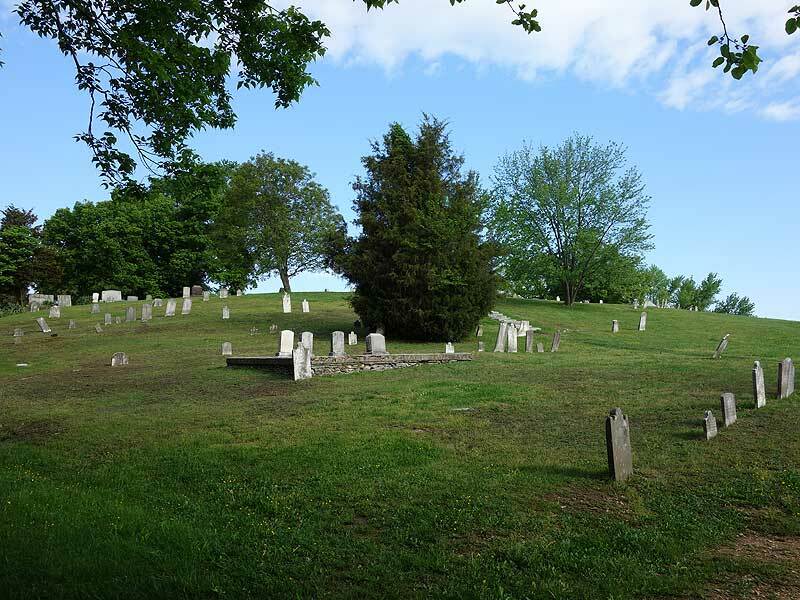 From Jefferson Rock it is a short distance along the A.T. to Harper Cemetery. 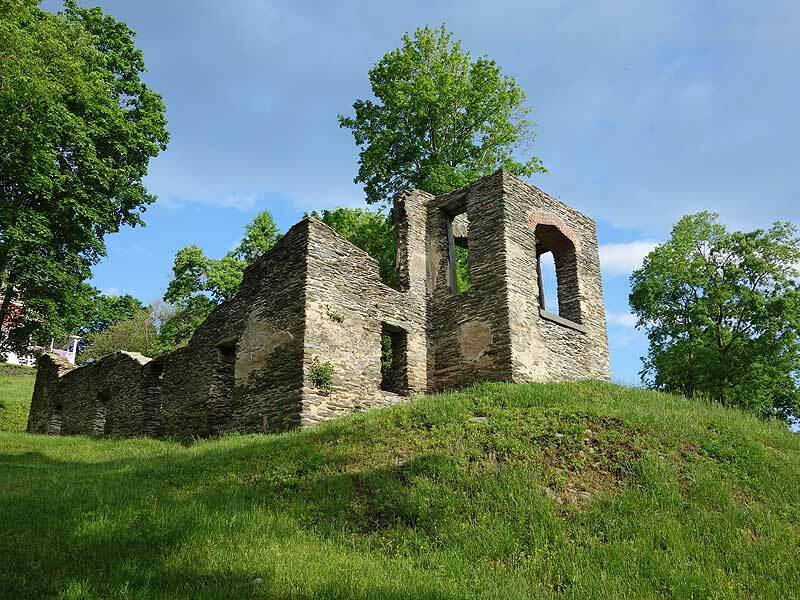 The 4-acre cemetery was set aside by John Harper, a Pennsylvania architect who passed through the area in 1747 then settled there, founding Harpers Ferry. Continue along the A.T passing a turn off to the Appalachian Trail Visitors Center on the right, then stay right on the A.T. where the trail splits, and continue to US340. Mile 1.1 - Pass above the secondary parking area on the A.T., crossing the Shenandoah River on US340. 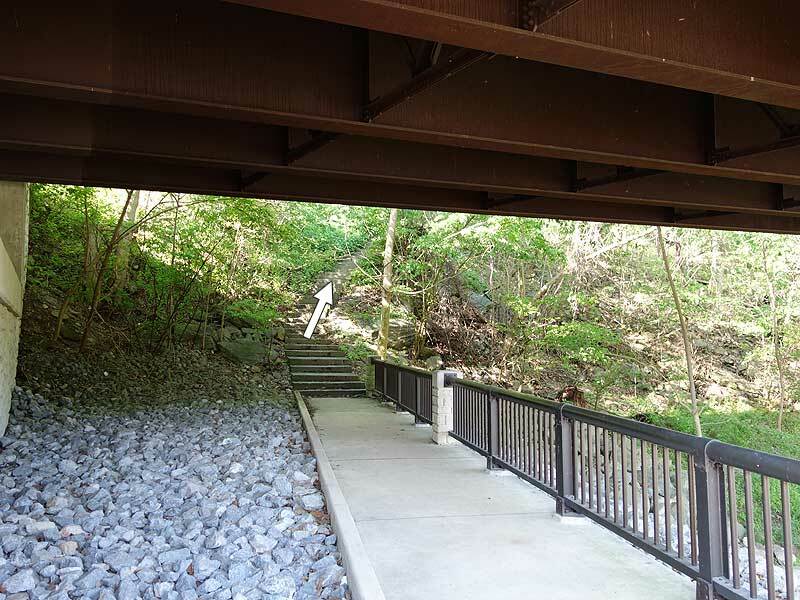 At the opposite end of the bridge the A.T. descends down and under the bridge, then begins its ascent of Loudoun Heights. 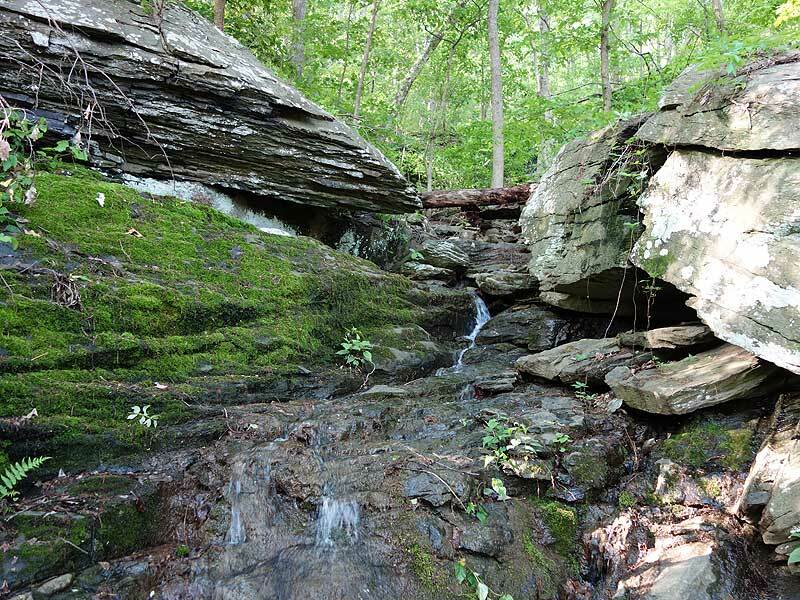 As the A.T. climbs the mountain pass over a small creek that can run nicely in the Springtime. Mile 2.2 - After ascending for 0.5 miles cross Chestnut Hill Road. From Chestnut Hill Rd. 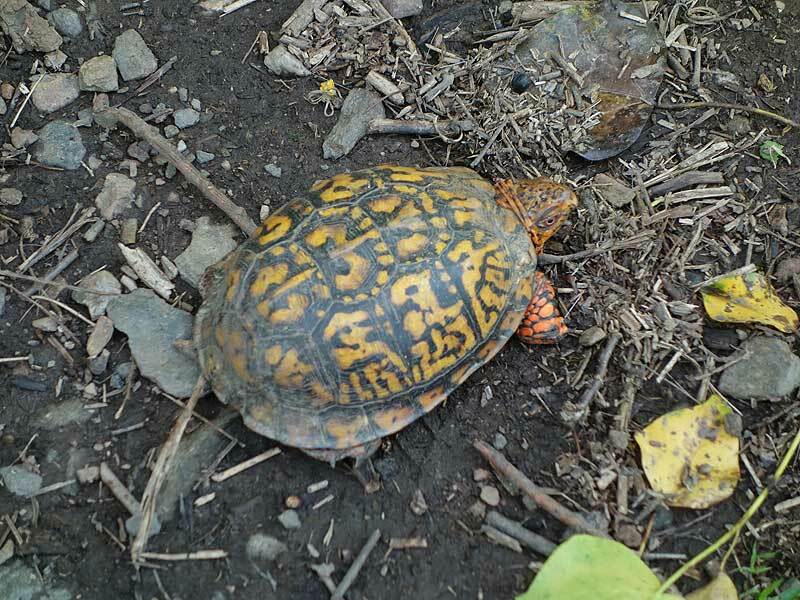 it's 0.3 miles to the intersection of the orange blazed trail you will return on later in the hike. 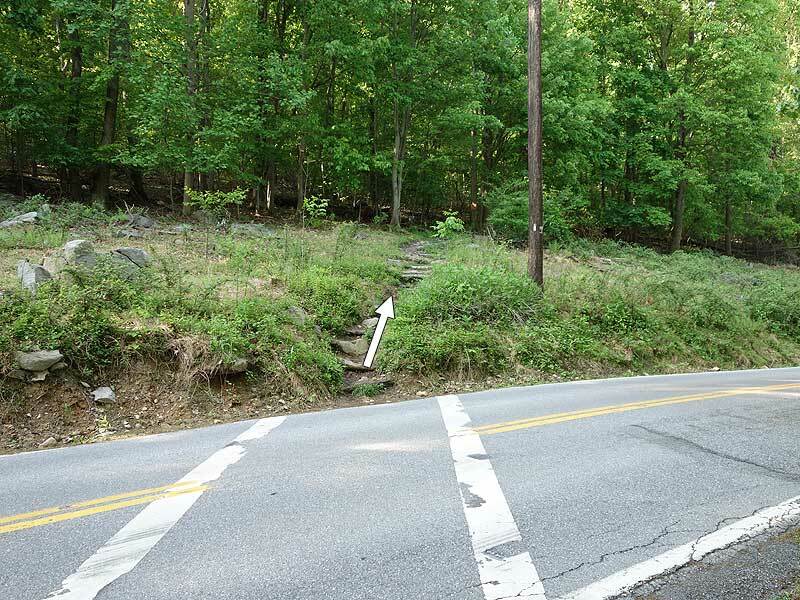 Continue upward on the A.T. for 0.2 miles to the ridge and intersection with the blue blazed Loudoun Heights Trail. 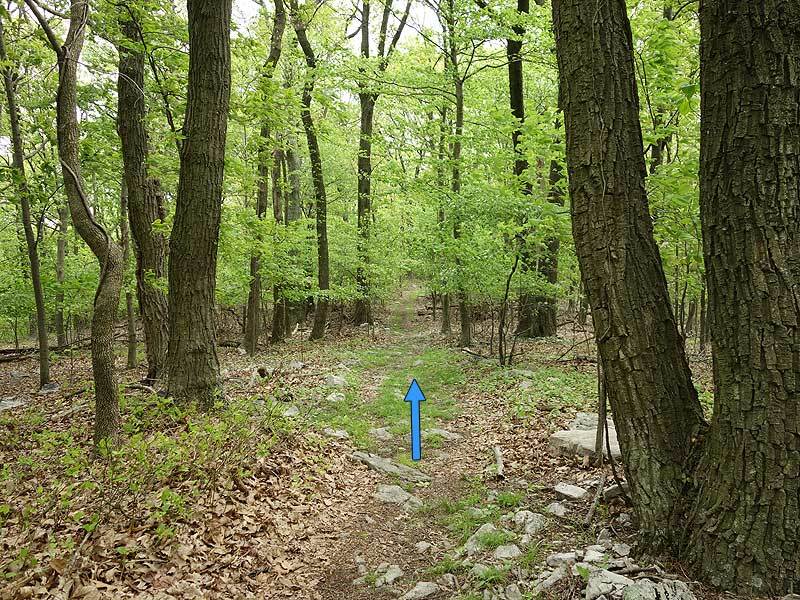 Mile 2.7 - Turn left on the blue blazed Loudoun Heights Trail following the ridgeline north and passing the foundations of a stone fort before reaching the intersection of the orange blazed trail. 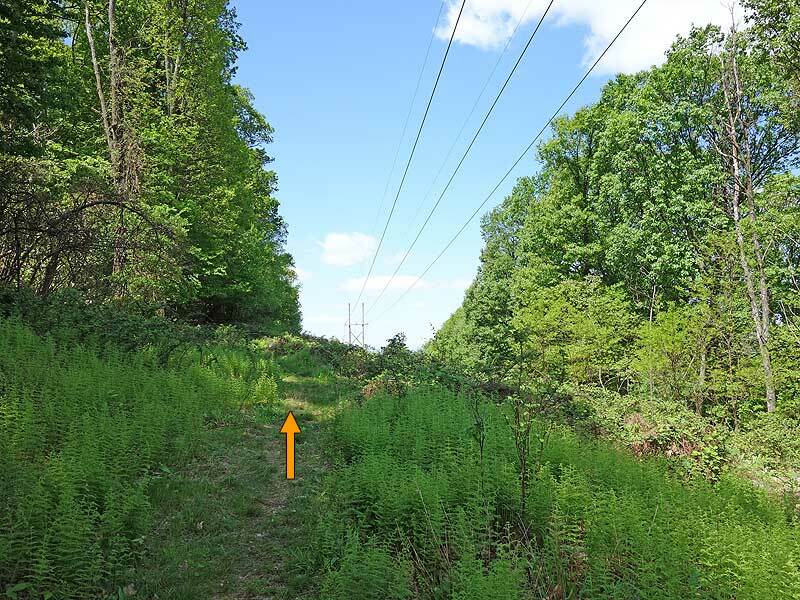 Mile 3.2 - Continue on the Loudoun Heights Trail north passing a view of the Potomac River at a power line clear-cut. The trail then descends to the right and passes around the mountain. 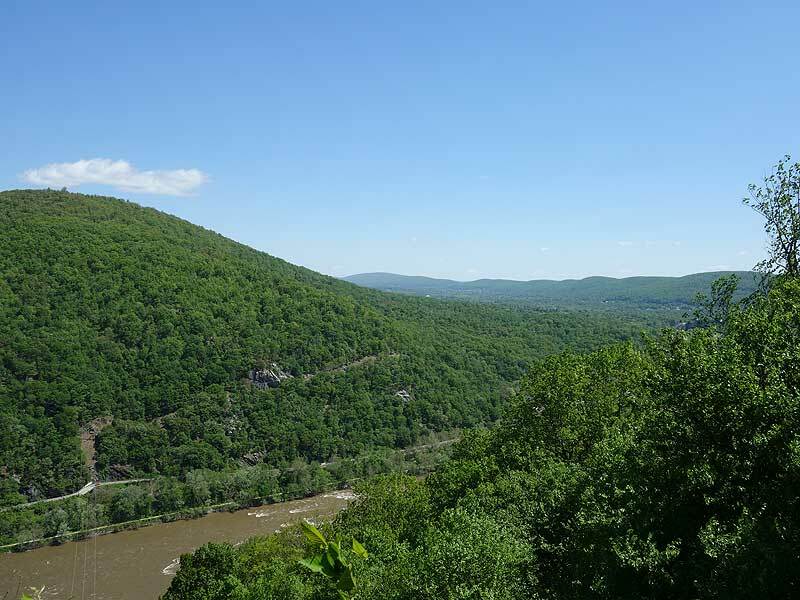 Mile 4.1 - Arrive at Loudoun Heights Overlook where the Loudoun Heights Trail ends. 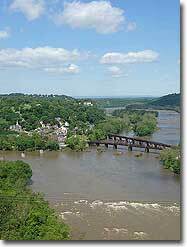 The overlook has beautiful views of Harpers Ferry and Maryland Heights. 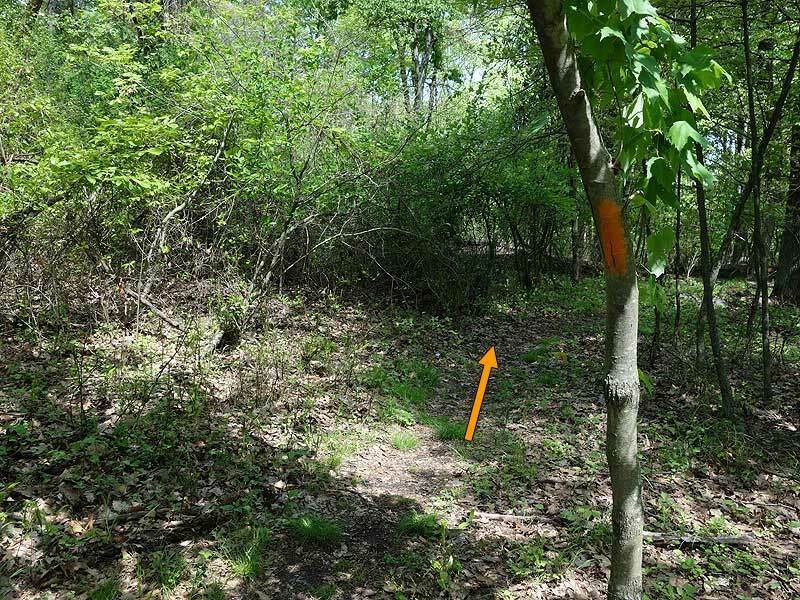 Now start your return by retracing your steps uphill back to the orange blazed trail intersection. Mile 5.0 - Turn right downhill on the orange blazed trail as it winds down passing through the power line clear-cut before arriving back at the intersection of the A.T. you passed on the way up. 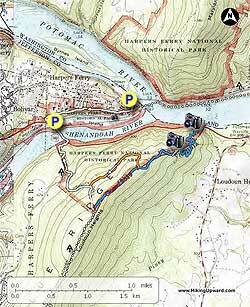 Mile 6.0 - Turn right downhill on the A.T. retracing your steps down the mountain, re-crossing the Shenandoah River over US340, and back through historic Harpers Ferry. Mile 8.5 - Arrive back a the train station parking area. Nice, long hike. Lots of shade. Gnats/bugs were pretty bad, but wildlife amazing! Saw lots of groups of deer up close. Trail gets long near the end, but immensely worth the final mile. 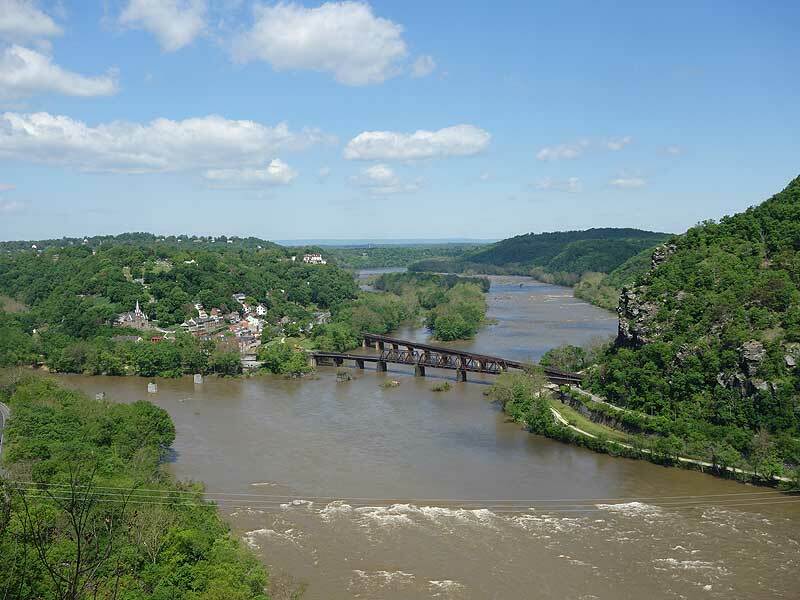 Didn't see many people despite it being packed in Harpers Ferry-I think most people hike the Maryland Heights trail. Very peaceful at the top-worth hauling lunch/picnic and taking a nap before heading back. Great hike. The good workout makes you appreciate the view at the overlook. 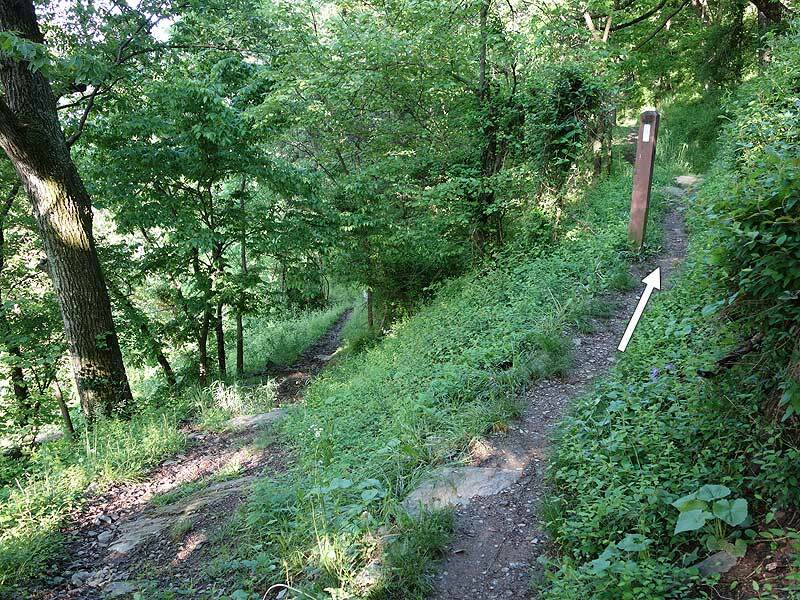 The uphill section on the AT from the highway 340 bridge will make you sweat, but once you reach the blue-blazed trail that runs along the ridge line to the overlook, it's easy. 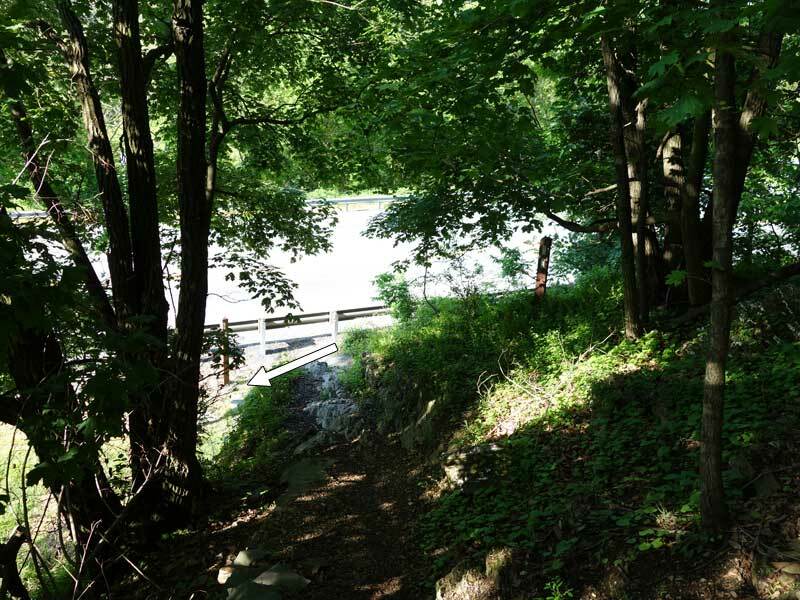 With the full foliage of summer there are only a few clear views until the overlook, but the trail is nice. On a summer Saturday I only encountered about a dozen people once I left the bridge, so, while it's not solitary, it's certainly not as congested as Maryland Heights. I had the overlook to myself. I think that the view from Maryland Heights is better, but the different perspective that Loudoun offers is pretty cool. 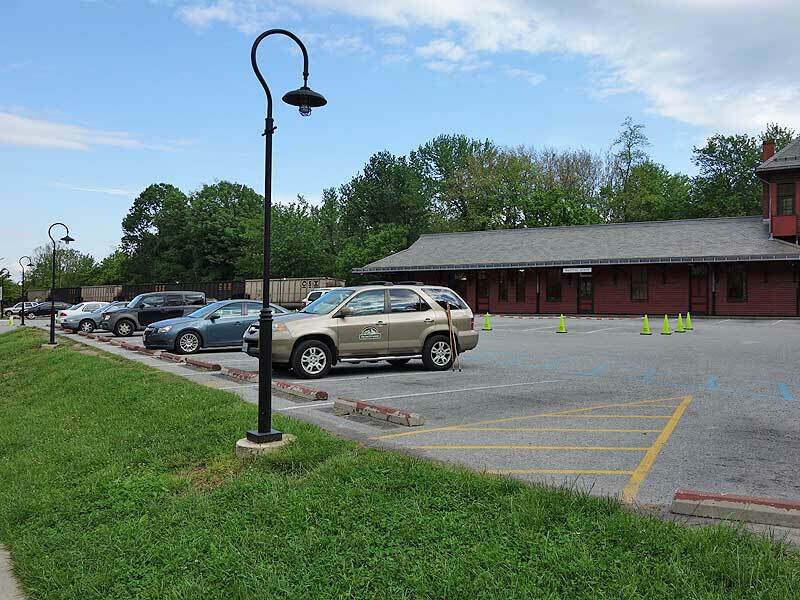 If you want to skip the walk through town, be assured of parking, and save the fee at the railroad station parking, park at the Visitors Center. Take the free five minute shuttle bus ride to the stop just outside of town, and start your hike from there. I will be honest -- this was not my favorite hike. The outlook was neat, but by the time I got there, the bugs had been terrible and I had seen so few people I managed to spook myself a bit (I love solo hiking for the record, but in this case I saw only 3 people over the course of several hours so this might be a ringing recommendation for some) and I thought that the view from MD Heights was slightly better (I realize this might be an unpopular opinion). I'm not sure if it was just an off day for me or if this hike just isn't for me but I didn't love it, but it still was a nice solid workout and it is very quiet. Planning to go on a weekend? Get there early! I started at 6:45am and when I came back to my car at 10:30, the parking lot was full. 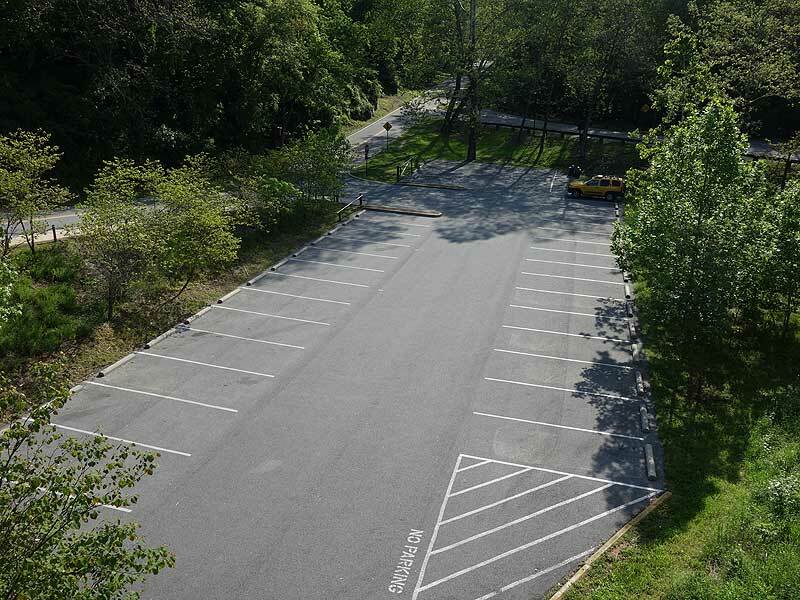 The fee for parking is $10 at the train station--I didn't see anywhere to pay when I left may car, but when I came back, there was a ticket on my windshield (you can mail it if you forget cash the day of your hike). 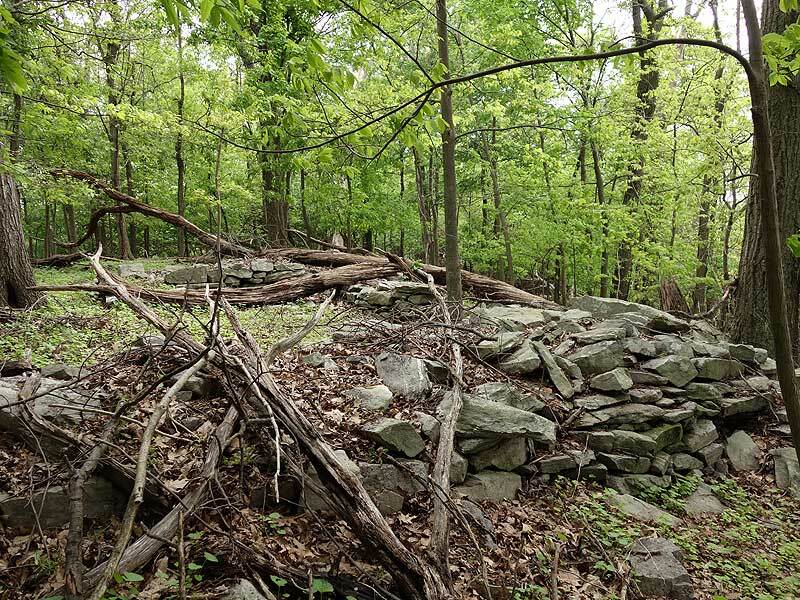 I found that the section between the bridge and the Loudoun Heights trail was definitely the most strenuous, but manageable. I made it to the overlook at 8:30...so it took me an hour and 45 minutes to get there. Nobody else was there which was nice, and I got to take my time eating breakfast and enjoying the view. On the way back, I saw more groups of hikers making their way up to see the overlook, so I felt pretty good about my decision to get started early. What I don't like about the hike is that there is so much traffic noise from 340--I know it can't be helped, but I prefer getting out into nature to get away from that. Based on the other reviews and considering I hiked midweek in late fall, I expected to find complete solitude on this trail. 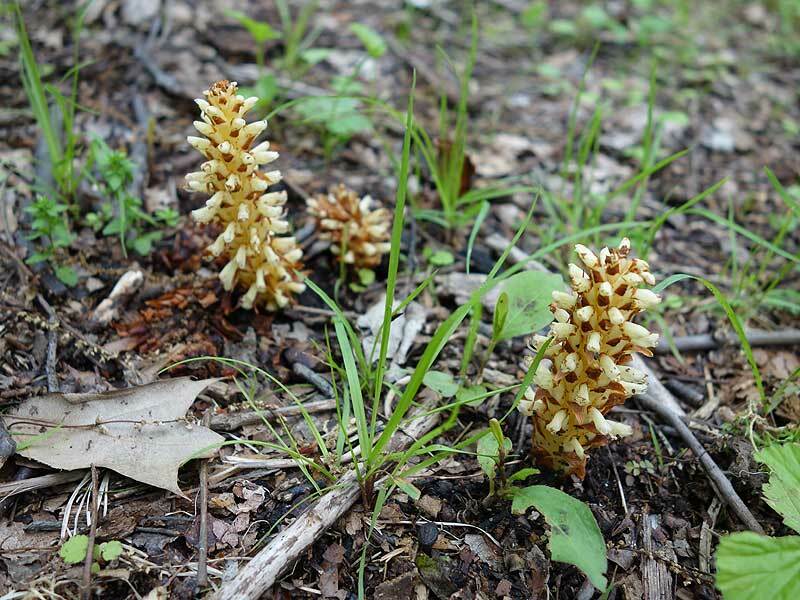 To my surprise, I saw quite a few groups all along the trail -- not crowded by any stretch, but not isolated either. 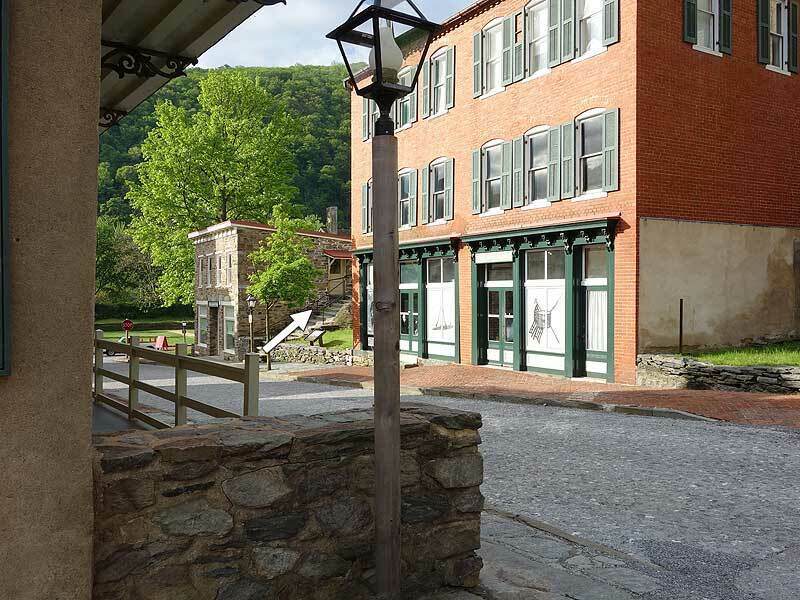 The first portion along the AT through Harpers Ferry is well traveled, but quite fun & historic. I thought crossing along the highway bridge was a nice change of pace from the usual, though hardly considered hiking. The climb up and down the ridge had enough switchbacks to make the elevation manageable, although I was suffering the effects of hiking Weverton Cliffs & Maryland Heights the day before & moving at a quite slower than normal pace. It took me 5.25 hours to complete this hike with a brief stop at the overlook and some time chatting with a couple about other AT day hikes. The blue trail along the ridge was much more pleasant than the orange trail that spends a good portion following a power line clearcut. The return back into town allows for an easy side path through the old Storer College campus and to the ATC headquarters. This is another "don't miss" hike and well worth the effort.